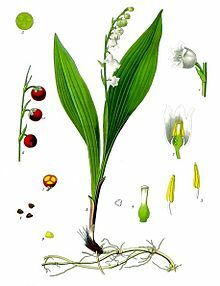 Convallaria majalis is a perennial monocotyledon to 20 cm tall, extensively colonial, from rhizomes. Leaves about 10 cm, elliptic, entire, dull blue-green. Flowers white, radially symmetrical, bell-shaped, petals fused into a round base with short, flaring lobes, very fragrant, 0.6-0.9 cm wide, dangling in a row from a curved stem. Fruit fleshy, red, 1 cm wide, seeds numerous. Habitat: Understories of second growth woods at old garden sites, or escaped from garden waste. May sometimes be dispersed by birds. Shade tolerant. Notes: Aggressive. Displaces native forest herbs.